To Grab the offer Go to HomePage >> Introducing Airtel Dialer >>you will get confirmation sms from Airtel. To use these minutes you have to use Airtel Dialer only. You will get 2 GB cloud storage only. 2. You can also download app by scanning this QR Code. 3. Sign up to my airtel app with your airtel Number. 4. Now Log in into My Airtel App. 5. Tap on your phone to get amazing Offers from airtel. 6. You will see Your Offers which you can claim. 7. Claim these Offers and Follow the Instructions to use these Offers. 8. Complete the payment, you can even choose your mobile balance to pay in my airtel app. 1. Pick This Offer in your special offer. 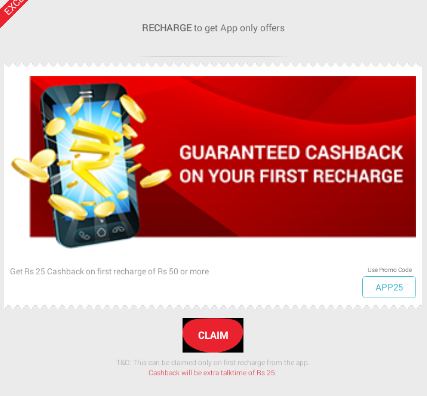 51 Responses to "My Airtel App Offer – Rs 25 Cashback on Rs 50 Recharge"
Is there a base charge ,when we starting using this app ? Hiiiiii My airtel apps rite now Downlood.